Given the considerable need for land rehabilitation in Asia, and global aspirations for Forest Landscape Restoration (FLR) such as the Bonn Challenge and the New York Declaration on Forests, the FAO Asia Pacific Forestry Commission have developed a regional strategy and action plan for forest and landscape restoration. To promote dialogue, learning, collaboration and coordinated action in the region, the first South Asia Regional Consultation on Forest Landscape Restoration, Forests and Beyond, was convened in India in 2017. As a follow-up to these consultations, members of the Global Partnership on Forest and Landscape Restoration (GPFLR) contributed to an IUFRO-led knowledge-sharing workshop in Sri Lanka on best practices for implementing forest landscape restoration in South Asian countries. 53 professionals from relevant governmental and non-governmental organizations from Bangladesh, India, Nepal, Pakistan and Sri Lanka, as well as 7 FLR experts from overseas, contributed to the workshop. Several participants of the workshop admired the recent progress of landscape restoration in the South Asian region. Indeed, the first key messages from the workshop highlighted the significant number of reforestation and forest restoration initiatives already being implemented throughout the region. The policy and regulatory environment, as well as financing mechanisms, are being constantly developed to better suit the needs of restoration implementation. The prevalence of landscape thinking is increasing in the region; a thinking of interdisciplinary perspectives taking into account the multiple functions and actors of landscapes that can optimise benefits across scales. However, there is still room for improvement for FLR practices in the South Asian region: Stakeholder participation and decision-making needs to be broadened and further institutionalized in all aspects of FLR. In order to establish a locally accepted, complementary and coherent combination of agricultural and forestry production systems, enhanced cooperation is needed between local communities and agriculture and forestry departments. The existing forestry, agriculture, disaster risk and rural development plans need to be oriented together towards broader national commitments on sustainability goals. Scaling up the local programmes is challenging, but possible with the help of improved forestry and agricultural practices, and increased stakeholder participation. Knowledge-sharing among local stakeholders is already an integral part of FLR implementation, but it should be intensified to include landscape thinking, financial management and the use of technical tools. In conclusion, effective FLR implementation on the field requires continuous training, efforts and scaling up both from FLR facilitators and local stakeholders. Demonstrating success stories will help tremendously to convince others to take action in restoring lands around their local environment. 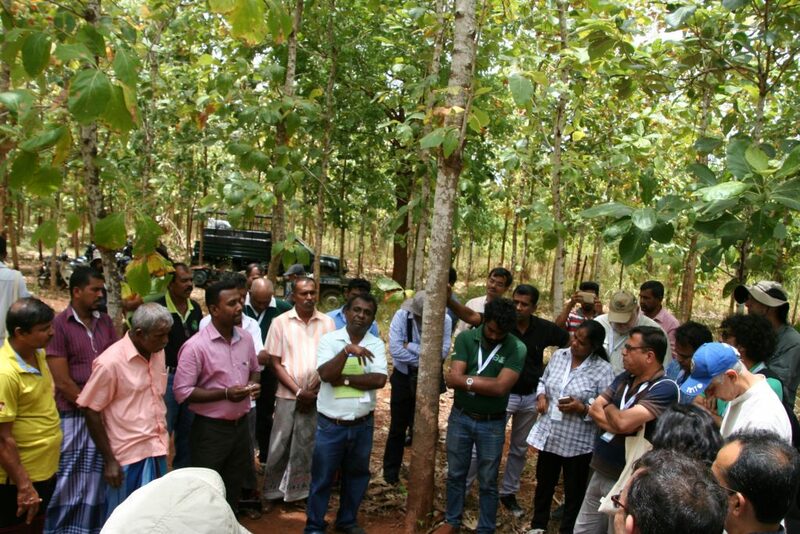 The workshop held in Sri Lanka showed excellent success stories of agroforestry teak plantations, improved wildlife habitats and mangrove rehabilitation. Scaling up such field examples will make them even more relevant for demonstrating the necessary societal changes that are needed to achieve lasting changes towards a restored landscape. In "Global Landscape Forum - Social Reporting", "Publications"
In "Event", "Global Landscape Forum - Social Reporting"